They say 'necessity is the master of invention', but how do you move a man-made mountain across the globe without deconstructing it? Discover how the seemingly impossible is made possible. Quickly convert the latest exchange rates including NZD, AUD, USD, EUR, GBP and even Bitcoin. How do you move a 50,000 ton offshore structure across the globe? You won't find a crane large or strong enough to lift that kind of load and even if you could, how would you transport something that was never meant to be moved? 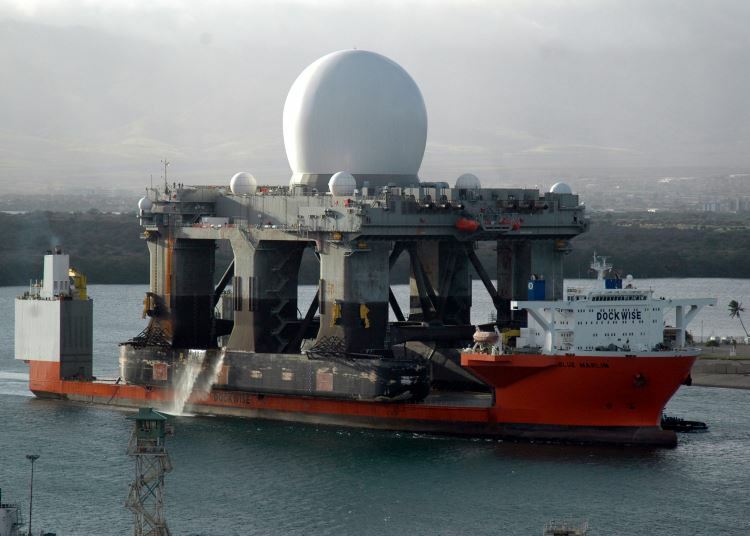 In a remarkably simplistic, but ingenious engineering triumph, the Blue Marlin is designed to sink, submerging a giant platform (resembling a flatbed truck) beneath its cargo. It takes approximately 12 hours for the 100,000 ton capacity ballast tanks to fill, allowing anything from oilrigs to the Sea-Based X-Band Radar (pictured - towering 85 metres in height), battleships and nuclear submarines to be manoeuvred above it and lifted out of the water for secure international transport. Stretching a formidable 225 metres in length, the Blue Marlin can sink up to 25 metres below the surface and can accommodate 60 people, complete with workout room, pool and sauna. In June 2004 the Blue Marlin set a new world record transporting the world's largest offshore structure from Okpo, South Korea to Corpus Christi, USA. Weighing in at 60,000 tons, BP’s Thunder Horse platform has a height of 129 metres and width of 105 metres.